My sister is a creative genius. Really. She's the most creative person I know. So when she came up with this idea for wrangling all of Katbird's hair supplies (no, not Air Supply, the 80s band... I'm talking rubber bands, ribbons & headbands) I had to share it with all of you. 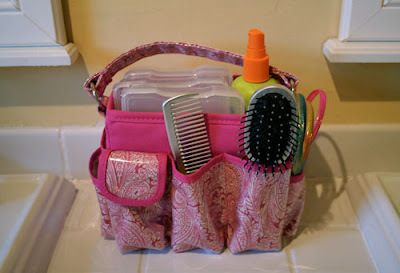 The best part is that it's got handles, so no matter where we I am while doing her hair (um... chasing her down the hall) I have everything I need in this little caddy. 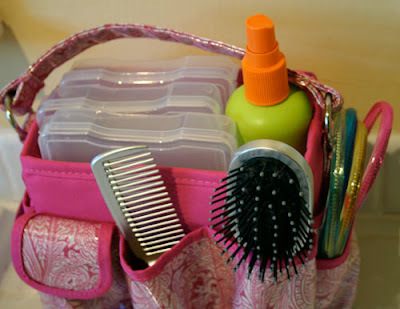 Really, this could totally work for me too with my hairspray, bobby pins and headbands too. Genius, I tell you. great idea love the pattern too! Might have to try this I can never find what I need as I shove everything in the same draw! Thanks for the tips! i love staying organized and this will help a bit. You're absolutely right, that is genius! I always shove all my hair supplies in a round basket, and everything gets messy. 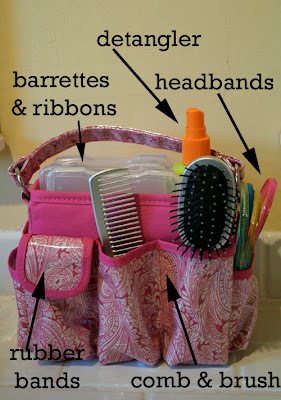 It's a chore to look for that one specific barrette. Can't wait to get organized! This is awesome. I mean thinking out of the box is what you call creativity. Really Tonya your sis is very creative. She has suggested a superb idea of keeping all the hair accessories at one place and carrying them wherever you want without any hassle. Lovely advice for all those fashion freaks who love buying new and different stuff. And love being more fashionable than others. That is very creative indeed. Your sister is very resourceful. Kudos to her! WOW, super super love this idea and shared it on my blog! Thanks to Tonya's sis for the super wonderful idea!! LOVE it!